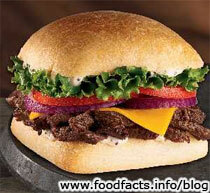 Jack in the Box has introduced another sandwich to their Ciabatta line, the Sirloin Steak 'n' Cheddar Ciabatta. The sandwich features sirloin steak on toasted ciabatta bread with cheddar cheese, red onions, tomatoes and lettuce topped with peppercorn mayo. It sells for $4.59 at most US Jack in the Box locations. Jack's Sirloin Steak 'n' Cheddar Ciabatta has 770 calories, 339 calories from fat, 37 g of fat, 8 g saturated fat, .4 g trans fat, 112 mg cholesterol, 1307 mg sodium, 65 g carbs, 4 g fiber, 5 g sugars, 43 g protein.